Hi Stampers! I just wanted to post a quick note showing you what's been monopolizing my time for the last few weeks. Yep, you guessed it, COASTERS! I'm participating in a craft fair this Friday and I'm giving handstamped stone coasters a shot. 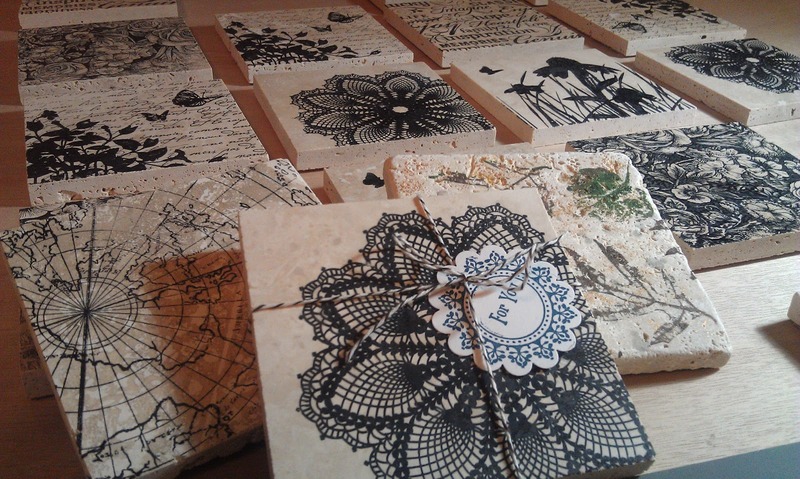 They are made from either travertine or tumbled marble, and are fully backed with cork to protect your furniture. To see how I made them, please see this post. Since this particular craft fair is where I work full time for my "real" job, I'm taking a slightly different spin on these. I'm selling them individually at the event (great for stocking stuffers or boss/coworker/teacher gifts, and I will also be accepting custom orders for sets of 4 for delivery the week before Christmas. I letting people choose whichever designs they like, and they can mix and match. I took a sampling to the office today, and I already have 3 custom orders! So, it's going to be a busy week for me as I finish my preparations, and I couldn't be happier! Hope your holiday preparations (and your holiday cards!) are coming along swimmingly! And if you're local to the Metro DC area, please stop by UMUC's Largo location (1616 McCormick Drive, Largo, MD 20774) on Friday, December 7 from 9-4 to support local artisans! Here's just a quick post to show you what I've been working on today. 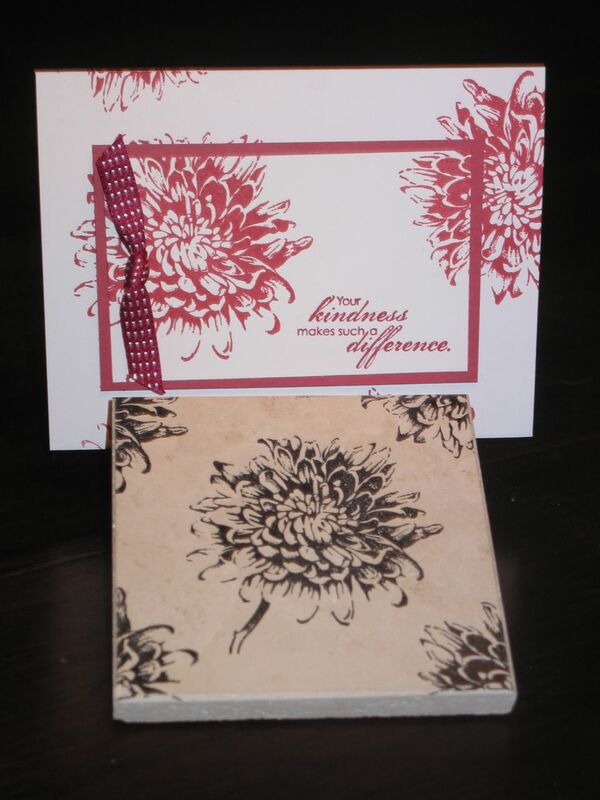 I've been busily prepping for a craft show and thought I would give these Card and Coaster Gift Sets a try. I previously showed you some of my coasters in this post, but I thought I would switch it up this year and make a coordinated gift set. These will (hopefully) make nice teacher, boss, or coworker gifts, and they couldn't be easier! 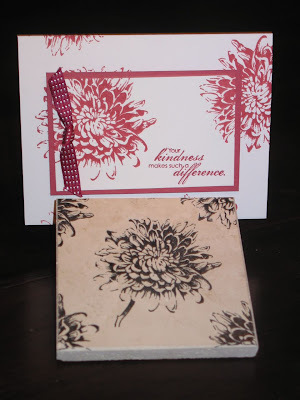 I'm using the Blooming With Kindness stamp set (I absolutely ADORE this set... the font is fantastic (and coming from a font-junkie such as myself, this is very high praise ;-) and the accompanying flower is truly iconic! 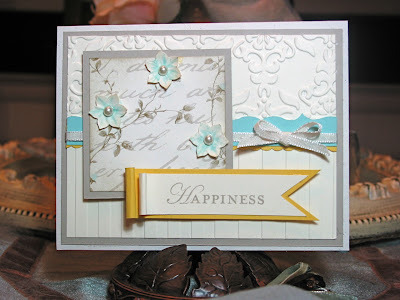 This card has been percolating in my head for awhile, ever since I saw this lovely creation by Shana at Stress Free Stampin (her blog is GREAT -- I highly encourage you to stop by and spend hours looking over her lovely creations!). As my creative process began, I found myself deviating from her original design (that tends to happen from time to time ;-) and here is the result! I'm not gonna lie, I'm quite smitten with the end result, even if the picture doesn't do this beauty justice! 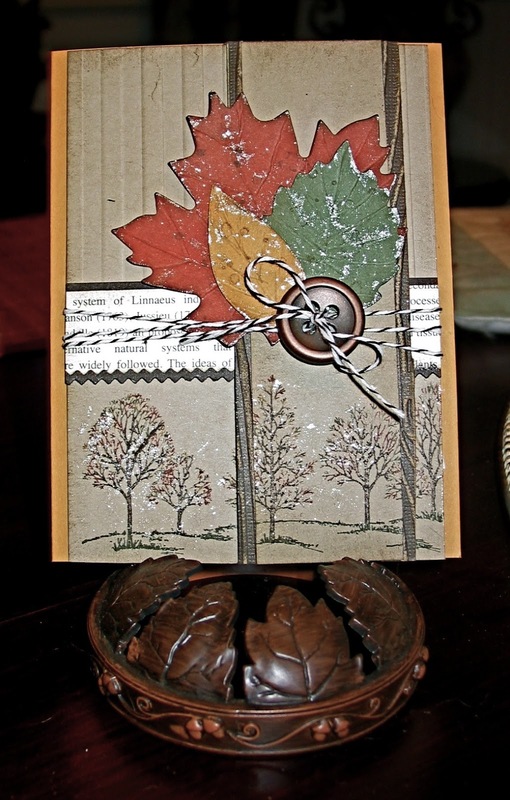 The leaves were cut using the Autumn Accents Bigz Die out of Cajun Craze, More Mustard, and Always Artichoke cardstock. They were hand embossed, crinkled and distressed, then peppered with waterspots, courtesy of French Foliage, and dabbed with Champagne Shimmer Paint for some shine. The stamped tree image is from everybody's favorite - Lovely as a Tree - which was colored using Early Espresso, Always Artichoke, Cajun Craze and More Mustard, and more shimmer paint (Masculine cards are allowed to have some glam, right?!?!). Toss in some Early Espresso Core'dinations cardstock, zipped through the bigshot and sanded to give it a woodgrain texture, add in some Newsprint DSP, Sponge the edges with some Soft Suede ink and then tie everything off with some Bakers Twine and a beautiful bronze button. ANYWHO, thanks so much for taking a peek! Accessories: Bakers Twine, Autumn Accents Bigz Die, Finishing Touches Edgelits, Woodgrain Embossing Folder, Stripes Embossing Folder, Bronze Button, Champagne Shimmer Paint. First off, let's get down to the details of the October special. 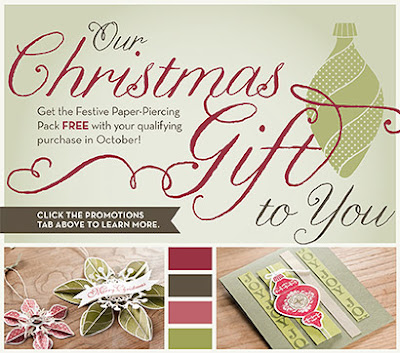 Stampin Up is offering a FREE matching Paper Piercing Template with the purchase of the Ornament Keepsakes Stamp set and Candlelight Christmas Designer Series Paper, or with the Ornament Keepsakes Bundle (stamp set and coordinating Die-cutting framelits) and Candelight Christmas DSP. MICHEY'S NOTE: When ordering, be sure to use the above item numbers. Your free paper piercing template will be included when you use these special item numbers. So, as I mentioned before, I had some good crafty time today! Why should you care? Well, for those local customers that purchase ANY of these kits, i'm offering a FREE CLASS in my home during the month of November! As space allows, I may allow non-purchasers to attend for a fee, but when you place your order with me, you'll be guaranteed a spot and best of all, it's FREE! Pretty cool, eh? Yep, you'll be making these three lovelies to help get your creative juices flowing JUST IN TIME for making your Holiday cards with your new stamps, paper and framelits -- pretty cool, eh? So, if you're interested in stamping with me in my home in Silver Spring, MD, the first step is placing your order from my online store, and while you're at it, sign up for my newsletter over there in the right column of my blog. More details as to the time and date of the free stampstravaganza (is that even a word? If not, it is now ;-) will be forthcoming! Some of you are probably familiar with Handstamped Sentiments, a weekly challenge and inspiration blog. Well, it just so happens they have a few design team spots available, so, I figured I'd give it the good ole college try. HSS, you see, holds a very special place in my heart. Back when I first started blogging, My Cheery Cherry Blossoms card was chosen as an artist pick, which happened to be the very first challenge I ever won. That gave me SUCH a boost, I'd love an opportunity to give back. I recently discovered (quite by accident, actually) that the negative strip left behind after cutting out a Fancy Favor Box makes a REALLY COOL border strip, and that strip in pool party is what started this card off. The background is double embossed with Vintage Wallpaper and Stripes and the patterned paper is from Attic Boutique - this paper is GORGEOUS... I'm so happy I finally cut into it! The flowers are punched from Boho Blossoms, and hand-colored using a modified technique I picked up from Kittie over at Kittie Kraft. Her flowers look way awesomer than mine do, but I'm learning, lol! I first saw this curled edge technique from Ann over at Stampin' Chic - she's my hero! I ADORE her style (she also introduced me to the Color Spritzer tool, which was love at first sight, lol!) and I'm constantly inspired by her creativity! 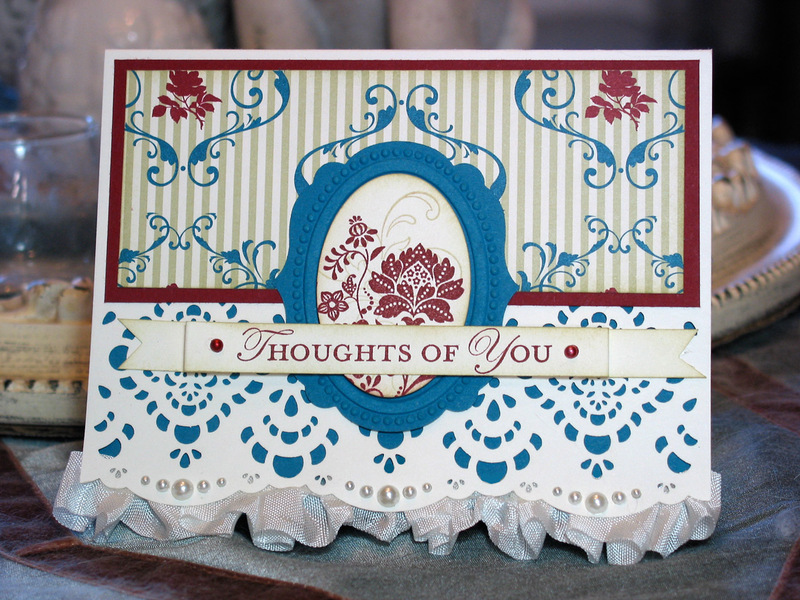 This card is very "michey"- it's kinda sophisticated and a little bit shabby 'n vintagey. Hopefully this entry is worthy of Design Team consideration -- I'm frequently inspired by the HSS gals, and I'm super excited for the opportunity to share the love! The striped panel is a piece of Everyday Enchantment DSP, which you can get for free with any $50 order now through March 31st as part of Sale-a-Bration. To this panel, I stamped the line motif, again from Creative Elements. This piece was embellished with Pear Pizzazz Pleated Satin Ribbon and a hand-pieced flower out of Very Vanilla and Calypso Coral. The sentiment is from Apothecary Art and I added a bit more bling in the form of regular and large basic pearls, which are new in the occaisions mini. The larger-sized pearl fills that bottom corner really well, dontcha think? For the swap I had to make 7 of these card fronts... if I could do it again, i'd go with something less involved than the layered flower - it was easy to do, but a little bit on the tedious side for repeating 7 times. Ahh well, I'm happy with the way this turned out, and the swaps I got in return were AWESOMELY INSPIRING! 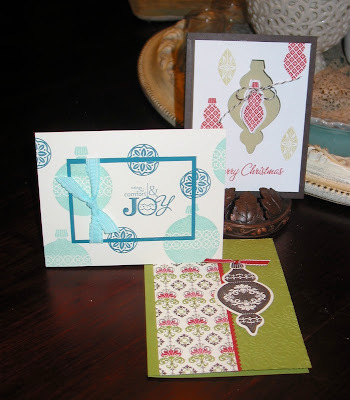 I started out with Designer Cuts laser-cut cards from the Occaisions Mini Catalog. I backed the front panel with a piece of Island Indigo and bunched up some seambinding onto the edge. I then added Pearls to cover where the seam binding was peeking through the pre-cut holes on the card edge. I framed out a piece of Timeless Portrait DSP with a Cherry Cobbler mat (i've had this designer paper for almost 6 months and haven't cut into it yet... SHAME ON ME!). I then cut a piece of Island Indigo using a Labels Framelit Die, and then added some texture with a Designer Frames Embossing Folder. 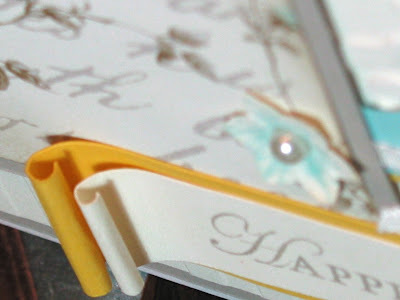 Don't you just love how the embossing folder fits perfectly inside the dicut? 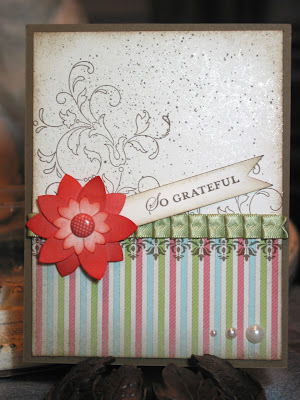 By the way, you can get this embossing folder FREE with a $50 purchase now through March 31 during Sale-a-Bration! The oval centerpiece is another freebie from Sale-a-Bration - Fresh Vintage - stamped in Cherry Cobbler. I overstamped a little peek of the flourish from Creative Elements in river Rock (It works really well with the flourish in the DSP, dontcha think?) and sponged the edges in river rock. I positioned this element so it looks like it's hanging off the blue scroll on the DSP... doesn't it look like a mirror hanging on the wall? The sentiment banner is from Loving Thoughts, and will hopefully let my dear friend know that she's in my thoughts and prayers.